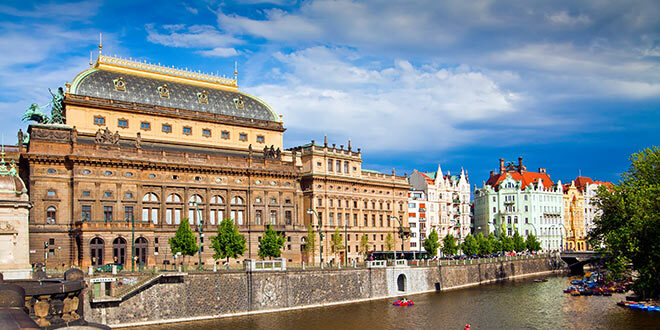 The National Theatre is the leading Czech stage and its repertoire consists of drama, opera and ballet performances. The theatre was founded in 1881, after a great amount of hard work was put into collecting the necessary funding needed for building such a huge theatre. Built in neo-renaissance style, decorated with incredible paintings and sculptures, the theatre was intended to be a symbol of the Czech nation’s independence and language. Unfortunately, in the same year the theatre was destroyed by fire and after two years of expensive reconstruction it was reopened on 18 November 1883 with a premiere of Libuše by Bedřich Smetana, a piece specially composed for this gala occasion. The theatre, perfectly equipped technically, ran without much alteration for almost a hundred years, but on 1 April 1977 the curtain fell on a performance of Alois Jirásek’s, The Lantern, and the theatre was closed for six years. Reconstruction commenced under the supervision of chief designer, architect Zdeněk Vávra. The extensive rebuilding and completion of the theatre’s surroundings had to be finished by 18 November 1983 – the hundredth anniversary of the original opening. At the same time several modern structures were built in the vicinity, one of which is now home to the Laterna Magika theatre. On this day the historic building was reopened to the public, again with a performance of Smetana’s Libuše. At present this historic, important and beautiful building, together with its adjoining modern building, offers four different genres of art: opera, drama, ballet and plays. On its repertoire there are about 60 performances. The operas are mainly classical. The most popular are Dvořák’s operas, Jaccobin and Rusalka, Verdi’s Rigolleto, Aida and La Traviata, Smetana’s compositions and many, many more. Ballets include Mowghli by Svoboda, Romeo and Julia by Prokofjev, Carmen, Cinderella, and works adapted from Shakespeare, Tchaikovsky, etc. Tickets prices: range from 310 CZK to 930 CZK.